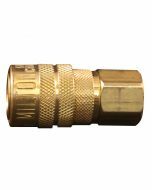 This 3/8" NPT Milton micro filter is supplied with pre-assembled automatic overnight drain, 3 stage baffle system and a porous bronze 40 micron filter element. 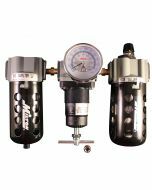 Micro filters remove harmful water or oil condensate, pipe scale, dirt and rust from compressed air systems. The metal bowl has a bowl capacity of 6 ounces. Maximum of 150 PSI and 48 SCFM.